Are you planning your first time taking the new furry companion to the dog park? Perhaps you just want to make sure you’re following all the rules when it comes to doggy socializing time. Many people don’t know proper dog park etiquette which is very understandable. A lot of dog park “should” and “should-nots” are not intuitive, but that’s why we’re writing this article! So, let’s dive straight in on a few quick tips to make sure you and your pup have a safe and fun time! First some basics: clean up after your dog. Nobody likes stepping in refuse. Get off your phone and pay attention to how your pup is interacting. 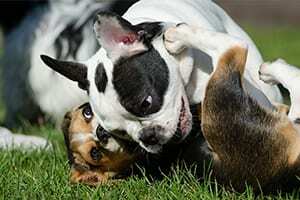 Don’t let your dog be aggressive towards other dogs or attempt to dominate them. If this starts happening, it may be best to leave the dog park today. Before heading to the dog park, make sure that your dog has had some exercise! Wait, I thought exercise was for the dog park? Nope the dog park needs to be supplemental exercise. If your pooch hasn’t had any exercise all day and suddenly they are presented with an extremely stimulating environment, problems can easily arise. Make sure your dog has excellent recall skills. This doesn’t mean coming every tenth time when there is no other external stimulation. Your dog needs to be able to divert their attention immediately to you and return when called in high energy situations. If your dog does not have recall skills and you bring her to a dog park, you are putting her and every other dog and human in the dog park in danger. Vaccinate! This one should probably come as a no-brainer. If your dog is younger than 12 weeks not up to date on their vaccines, don’t bring them to the park. Be mindful of any outbreaks or diseases endemic to your area such as Canine Influenza (CI) and ensure that your dog is properly vaccinated for these as well. Also, bring your own water bowl to reduce the risk of diseases in any public water bowls. Take your dog off the leash. When visiting dog parks for the first time, many owners are uneasy letting their dog run loose. However, this can make your dog feel trapped and anxious in this new environment. If another dog runs up and wants to play, your dog may become aggressive because they feel like they cannot get away. Don’t bring your dog’s own toys if they have trouble sharing. Your dog will not have a fun time at the dog park if they like to steal or guard food and toys. The dog park is a social experience for everyone involved and if your dog can’t play well with others then bringing them puts everyone involved in danger. For smaller dogs, make sure you don’t put them in the same play area as the large dogs. 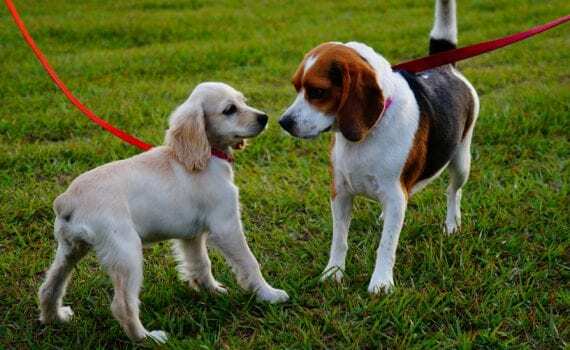 Even if your tiny pup often plays with the bigger dogs, the predatory instinct can be triggered by their quick movements and higher pitched barks. It’s on you for whatever may happen to your pup when they overly stimulate a larger dog in the big dog play area. Also, be careful when picking up your smaller dog. If they are being chased in what appears to be a menacing way, bringing them up into the air can trigger a treeing instinct in the chasing dog. With all the stimulation of a dog park, picking up your small dog may result in you being bitten or knocked down. In these situations, it may be better to simply lead your dog away from the confrontation. Finally, make sure to be welcoming to other owners. Nobody is born with the innate knowledge of how to raise a dog perfectly or have great dog park etiquette. If you see someone who looks overwhelmed, talk to them and show them the ropes. It’s not rude to politely point at any mistakes that may be putting any dogs or people in danger.